Side mount pick up with Tygard Claw. WITH over 450 units sold in 8 countries around the world, the Tygard Claw has already proven to be one of the most innovative forklift attachments available today. The solution has saved millions of dollars throughout the materials handling industry and in some cases reduced warehousing labour costs for wholesalers by up to 50%. Designed for durability, the Tygard Claw replaces manual labour and increases production efficiencies and is capable of distributing cartons and part pallets like no other clamping device can. The solution adds flexibility to layer picking applications and warehouse and distribution facilities, and any industry can benefit from the speed and versatility of the Tygard Claw. The Tygard Claw is a four-way pressure sensitive layer picking device that has been designed to lift and place single or multiple layers, split pallets and build mixed product pallets, which ultimately save time and money and optimises materials handling operations. Manual production is equal to approximately 250 cartons per hour in comparison to 950 – 1,200 cartons per hour with the Tygard Claw front mount, which equates to significant savings per carton. 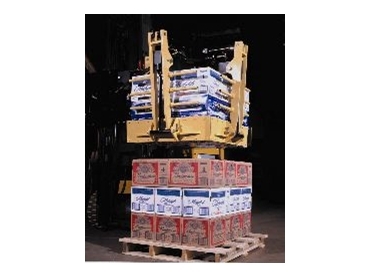 With a Tygard Claw side mount, production is equal to approximately 2,000 cartons per hour. The Tygard Claw lifts an average of 18,000kg per hour resulting in fewer injuries to workers. 3. Increases load accuracy and reduces product damage and breakage. 4. Decreases the size of a mixed pallet make-up area within a warehouse or distribution centre. 5. Reduces labour turnover and overtime costs during peak times, seasonal labour costs. 6. No specialised training for the operator is required. If the company has a forklift operator then they have a Tygard Claw operator. * Side mounted design runs on a single or dual rail system. * Side mount design can be applied on a 3,000kg capacity forklift equipped with a fourth valve function and a two stage standard mast. * The front mount is designed for smaller distributors. * Changes from a standard forklift operation in less than three minutes. * Front mount design can be applied on a 2,500kg capacity forklift equipped with a side shifter and fourth valve function. Companies like Millers, Coca Cola, Pepsi and Budweiser all have Tygard Claws in operation overseas. Leading forklift attachment company Eurolift recently took on the exclusive distributorship for the revolutionary Tygard Claw in Australia.